Many people believe that winter is the worst time to sell a home, the trees are not green, the flowers are not in bloom, and the sky is gray. 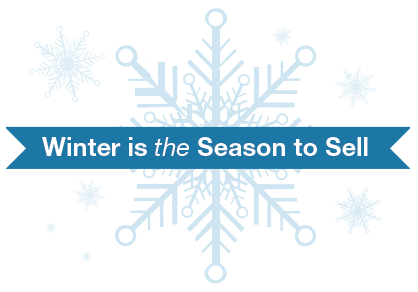 But the truth is winter is a great time of year to sale your home. Characteristically there are far fewer homes for sale in the winter than at other times of the year. This is a great benefit to a seller as buyers have far fewer choices. Furthermore while winter is usually much slower for home sales, the buyers looking are almost always more serious. Unless you are really serious about buying a home it is highly unlikely a buyer will make a practice of going out and looking at homes in the snow and frigid temperatures. So don’t fall for the myth that winter is a bad time to sell your home, but know that presentation is the key to staging your home in the winter. 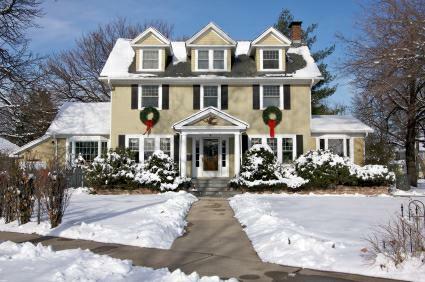 Here are a few helpful hints for Winter Staging your home to sale. Keep your home warm ~ Everyone tries to save money on utilities, but remember that you are selling a life experience when you are selling your home. The potential buyers walking through your door should be able to imagine themselves living in your home – something that is hard to do when your teeth are chattering from being cold. You do not have to keep the heat going all of the time, but definitely keep the house warm while you are showing if you want to attract offers. Selling a home is has a lot to do with emotional connections. Many times people will know they like a place within five minutes of walking through the door. Making it easier for them to connect with your home is a key to success. Take care of winters gifts ~ As we all know, winter can bring snow and ice, that while pretty can cause some major problems. To ensure that there are no winter hazards at your home, be sure to clear your walk ways, driveway, and roof edge. This will ensure that there are no accidents happening while you have people at your home. It is also for aesthetic purposes, people like a home with a well-kept exterior. Maintain the outside of your home ~ The first thing a potential buyer will see is the outside of your home. Therefore it is important to keep the exterior of your house well groomed and clean. Clean windows, porches, sidewalks, and other areas need to be well maintained while you have your home on the market. Oh the weather outside is frightful, but the Fire is so delightful ~ If your home has a fireplace you should definitely show it off to buyers. If you have a gas fireplace, start it up before a showing and add some ambiance to your family room area. However, a wood burning fireplace is not something you can just leave burning all the time. So you should set up the wood for a fire – at least demonstrating the potential for what the house can do. Talk with your real estate agent to determine the best way to do all of this. He or she may be comfortable starting a fire and taking care of it while showing your house. Daytime showings are best ~ There is only so much daylight during the wintertime. Try to time the showings of your home for when the sun is still shining. People can see how the house actually looks both inside and out and will be more likely to find it alluring. Since showings are out of your control it is important to have a well-lit exterior for the occasional showing past daylight hours. Take the time to make sure you have all the exterior lights turned on. If you have spotlights for the backyard or deck area make sure these are turned on as well. Selling a home in the winter can be more challenging to show of your home’s exterior living areas but it is well worth the effort. Accentuate comfort~ Potential buyers may be feeling overwhelmed from coming in out of the cold and feeling stressed from the house-hunting experience. Buyers may be wondering if they can actually find a house that they really like and will be good them and their loved ones. To ensure that your house dissolves all fears you should focus on the little things. You could put a nice fluffy blanket on the couch, turn back the comforter on the bed and make sure the interior lighting is warm and cozy. Some sellers like to bake cookies or pie during a showing to keep the house smelling like home. Others like to put on some relaxing music and light candles. What you do will depend on your personality and the space you are working with. Putting in a little effort to make the home comfortable in an otherwise uncomfortable season can work wonders for your sale. 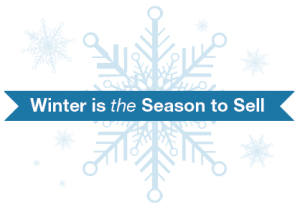 Embrace the season – The holiday season is one of the greatest advantages you have while selling in winter. Wintertime sellers often decide to decorate their homes for the holiday to really draw buyers in. Decorations, lights, scents and even presents under the tree can all do great things for your sale. Many potential buyers already have families or may be planning on having a family. Show them how great your home is for throwing holiday parties and enjoying time with family and friends. Just make sure you don’t go overboard. While being festive and having holiday decor can set your home apart from others it can also become a major distraction when you cross the limits. Ask your realtor their opinion. Because they are in and out of tons of homes so they should have a good idea of what is tasteful and what is “too much”. Please remove your shoes – At times sellers can become too accommodating to potential buyers, sometimes to your disadvantage. A great boundary to set that buyers may actually appreciate is the “no shoes” rule. After all wintertime visitors can bring all of the slush and dirt in from outside, it only makes sense to have them remove their shoes before entering your home. You have worked hard to prepare your home in anticipation of your showings, and the last thing you need is for dirt to be tracked all over your home. You can place a sign at the door letting visitors know that shoes should be removed prior to entering. By creating a warm and inviting ambiance, potential buyers will be better able to envision your home becoming theirs.